I may have gone a little overboard, but I couldn’t resist when I was asked to make an over-the-top rainbow drip cake!! This cake is made with my favorite vanilla cake recipe, and is colored with Americolor gel food coloring. I swear by Americolor, it’s the only gel food coloring I use. If you want your cake layers and colorful drip to be a super vibrant color, I highly recommend using gel food coloring. Liquid food coloring won’t give you as bright of a color. It can also throw off the consistency of the cake batter or rainbow drips if you add too much. Gel food coloring is much more concentrated, so it allows you to use less. A couple drops will create beautiful, bright colors. Gel coloring is also thicker, and won’t change the consistency of whatever you add it to. The cake layers in this rainbow drip cake are arranged following the color order of the visible spectrum. As a kid I had the hardest time remember the order of the colors in the rainbow. Then, my world was rocked when my art class teacher taught us ROYGBV. In my head, I read ROYGBV as Roy-GiB-Vee. I’ve had no trouble remember it since that day!! Which is a good thing, because nothing makes trolls on the internet more angry than messing up the color order. Heaven forbid you place the orange cake layer next to purple (violet) layer!!!! All jokes aside, my neurotic side really does enjoy having the colors in the proper order. It feels like everything is right where it’s supposed to be. And then adding the color coordinated lollipops and candy?! I could’ve stared at this cake all day. While on the topic of candy, I know that it can be hard to find monochromatic candy like this. I live a few blocks from Dylan’s candy bar, and got most of this candy from their color sorted candy buckets. However, Amazon has tons of monochromatic candy, and party city also has a great selection. If you don’t mind doing some sorting, you can also using rainbow colored candies like skittles, gummy bears, or Mike and Ikes! This cake is six layers tall, which can make it a bit of a challenge to cut into. If you’ve gotten this far, you’ve put hours into baking and decorating this cake. The last thing you want to do is mangle the first slice! 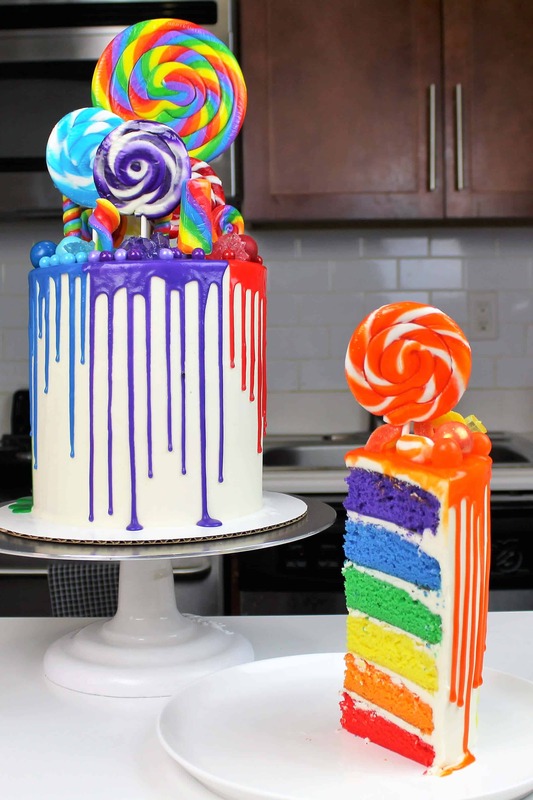 To cut and serve this rainbow drip cake, I recommend starting with a very sharp knife. It is easiest to cut a tall cake like this when it’s still slightly chilled. If made in advance, remove from the fridge about 45 minutes before you plan to cut into the cake. This way, the frosting will still be a bit cold and will help the cake keep its structure once it’s sliced. My next tip is to cut the cake with a warm knife. Fill a tall glass with very hot water, and let your knife sit in the cup for a minute. Dry off the blade, then slowly cut a decent sized slice. A large first slice will make it easier to remove it, and cut additional slices. Cut each cake slice in half horizontally, to create more reasonably-sized slices. 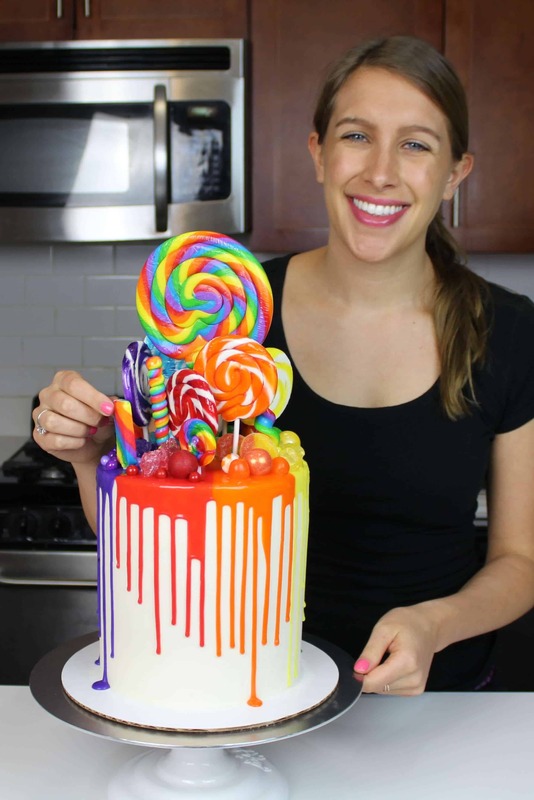 If you try this rainbow drip cake recipe, please tag me @chelsweets. Also use the #chelsweets so that I can see your amazing creations! 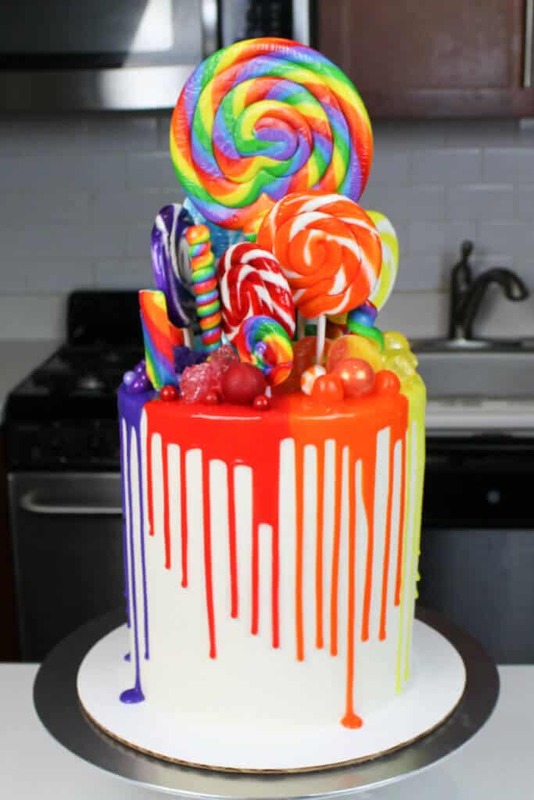 This colorful rainbow drip cake is the ultimate rainbow cake! 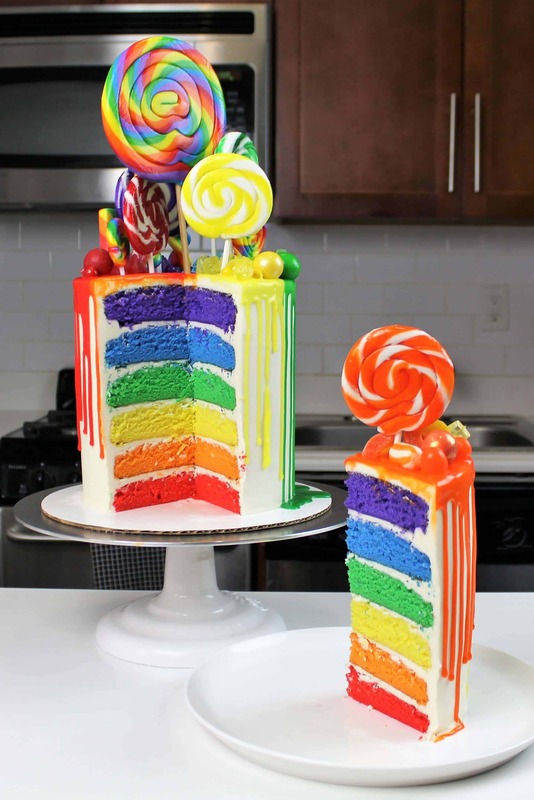 It's made with rainbow cake layers, a colorful rainbow drip, and tons of rainbow candy!! Preheat oven to 350°F. Line six, 6-inch pans with parchment rounds, and grease with a light spray of non-stick cooking spray. Divide the batter evenly between six bowls (about 300 grams of batter per bowl). Create red, orange, yellow, green, blue, and purple batter using a couple drops of gel food coloring. Mix by hand with a spatula until the batter is evenly colored. Bake for 30-32 minutes, or until a toothpick comes out clean. Allow the pans to cool for 10 minutes, then run an offset spatula around perimeter of the pan to separate the cake from the pan. Use a serrated knife to level the top of each layer. Divide the ganache evenly between six small bowls. Use gel food coloring to make red, orange, yellow, green, blue, and purple white chocolate ganache. Allow to cool until desired viscosity is reached (barely warm to the touch). Cover with plastic wrap to prevent crusting, and set aside. Stack and frost the rainbow cake layers on a greaseproof cake board, using a dab of frosting to help stick the first cake layer to the board. Start with the red layer on the bottom of the cake, then follow the color spectrum (ROYGBV) to arrange the remaining cake layers. Carefully divide the top of the cake into six equal sections (almost like slices of cake). Add one color of white chocolate ganache drips to each section. Use either a plastic squirt bottle and a spoon to add the drips to the cake. Top each section with matching lollipops and candy. One batch of cake batter makes about 1800 grams, so when I'm making a cake with six layers, I add 300 grams of batter into each pan. Hi what gel food colouring do you use? I live in the U.K. And watch you all the time but my cakes are never as brightly coloured as yours and it drives me crazy, I currently use colorflair food gels, thank you? This should say sugar flair not colour flair ? Sorry it’s quite late here. I use Americolor, it’s my favorite!! Hi! Does this recipe yield the 30-35 people serving size you said above? Also I watched the video and you mentioned freezing the cake layers. Does this mean I can back and freeze the cake layers a few days ahead of time and simply decorate the day before or day of and leave out to defrost? Thanks! My almost 3 year old has tasked me with making a rainbow cake for her birthday party this weekend ?? Yes! But 30 small slices, not bakery style! If you have a big party, you can make 1.5 batches of the cake batter. And yupp! I make my layers in advance, and let them defrost for about 20 minutes before decorating! Hello was wondering about storing buttercream cakes. Should you always keep them in the fridge after completed. Wondering if you ever have an issue with condensation on your cakes? It depends on the situation, but buttercream can sit out overnight and it won’t go bad! I usually put completed cakes in the fridge, but I also don’t live in a very humid climate, so i don’t have many problems with condensation. My daughter is having me make this cake this weekend for her bday party (fingers crossed) but what i am wondering is how the cake will hold up during the party until its cake time because its at a park. i live in fl Any Ideas? 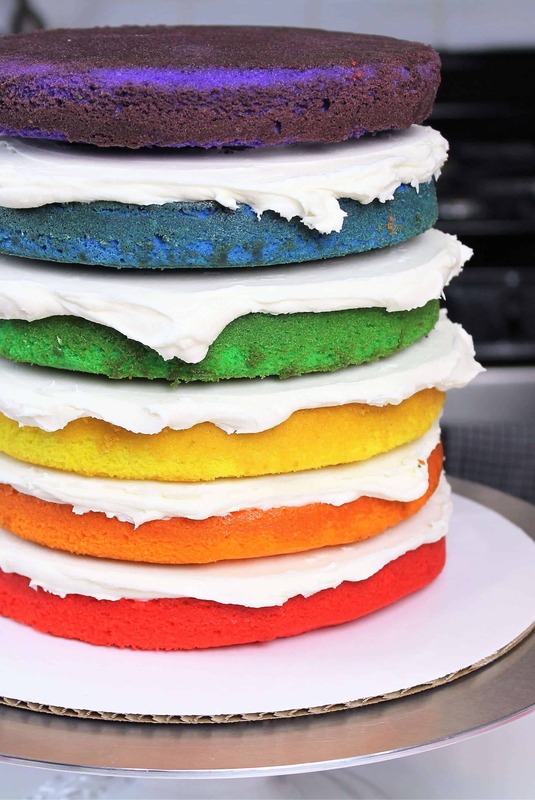 Hi I always wanted good white cake recipe to make a rainbow cake dose it taste better then a box cake thanks in advance. Hi, is there any risk of the cake “sinking” under the weight of the candies stacked on top? Thanks. definitely not! this is a some what dense cake recipe, which keeps it’s shape extremely well! as long as your frosting it’s too thin, it should hold up just fine! Hi! I am going to attempt this cake form my 11 year old son’s birthday party! He prefers chocolate frosting so I will be using your Easy Chocolate Buttercream recipe. I am not great at measurements, any chance you can provide me with the measurements needed for the chocolate recipe for this cake? Thank you so much!!! how fun! when you say the chocolate is the recipe, do you mean the amount of cocoa used in the chocolate buttercream? Thank you so much for getting back to me. We actually switched gears and will now be making a scaled down version of this cake. It will be a 4 layer 8″ cake. I am pretty sure I should double your Easy Chocolate Buttercream recipe. Can you confirm if this is what I need to do since the recipe is for a 7″ layer cake. Sorry! I am not very good at the conversion game LOL! Hi, you may have answered this already but whats the best white chocolate chips to use for the drip? I love using the Whole Foods mini white chocolate chips, because they melt super easily! but if you can’t get those, I also like the Ghirardelli brand!